Add tons of function to a small space with the Mind Reader Vesta Coffee Condiment Organizer with Coffee Pod Drawer. 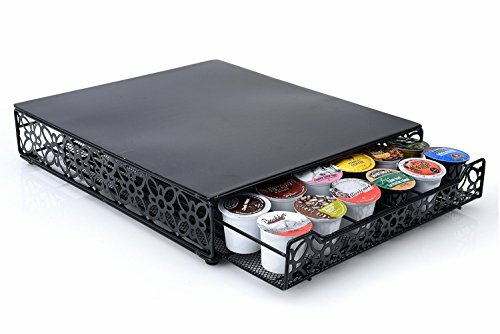 This break room essential organizes coffee pods, cups, sweeteners, creamers, stirrers, and even napkins. The durable plastic construction and black finish provide a sleek and stylish design that looks fabulous in any break room. Dimensions: 8.03W x 15.94D x6.1H in.. Made from plastic. Black in color. Great for the office. Customizable storage with removable dividers. Holds coffee accessories and coffee pods. Rubber grips underneath to keep in place. Dimensions: 8.03W x 15.94D x6.1H in. 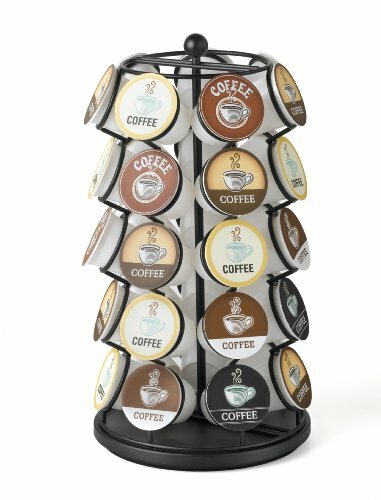 The NEX Tempered Glass Coffee Pod Holder is an essential product that customers would love to have it in their house or office to store, sort, and easily access their coffee pods. Usable in kitchen counter, cabinet or in pantry due to its simplicity and ability to help save space. Its multifunctional purpose provides various options of what customers can place within and will ensure it keeps your area clean. Constructed out of high quality materials, customers will be guaranteed its durability and sturdiness. This product is no need to assembly and can be places according to customer needs. The key to an organized room is to optimize as much space as you can, this NEX organizer is exactly what you need to help you stay organized! Kindly Note: Coffee pod holder only. Pictured coffee pod, coffee machine or other items are NOT included. Upgraded Design - Compared to the ordinary Coffee Pod Holder, four thick pillars can bear the weight of the coffee machine better. 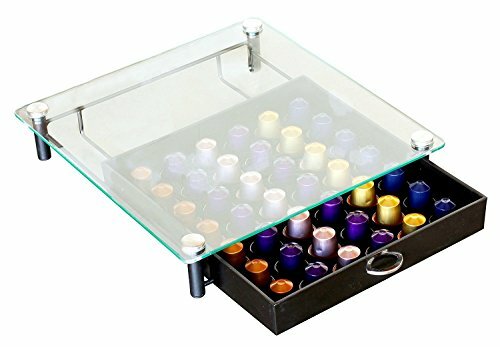 Tempered Glass Lid - Keeps your coffee pods from dust and scratching. Offers you a broad vision and can find most favorable taste in seconds without pulling out the storage drawer. Easy to clean. Space Saving Construction - Sliding drawer and sturdy construction with space saving design. Approximate Measures - 15.7 L x 13.3 W x 3.3 H.
Anti-Slip - Anti-slip pad on base can helps prevent scratches on tabletop surfaces. Exzact new space saving design helps you to create a neat and contemporary coffee station in your kitchen or office. 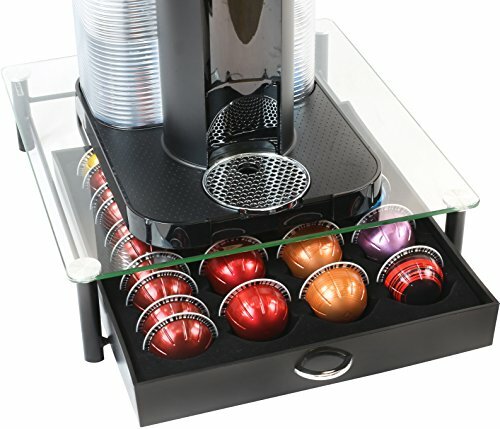 This coffee pod drawer allows one coffee machine stands on top with holding up to 36 Dolce Gusto capsules underneath. Material: Steel with coating. Dimension: 39 CM x 35 CM x 7.8 CM / 15.3 inches x 13.7 inches x 3 inches. Perfect for tidy up the kitchen and/or office surfaces, space saving. Care: wipe clean only. Exzact new space saving design helps you to cExzact new space saving design helps you to create a neat and contemporary coffee station in your kitchen or office. 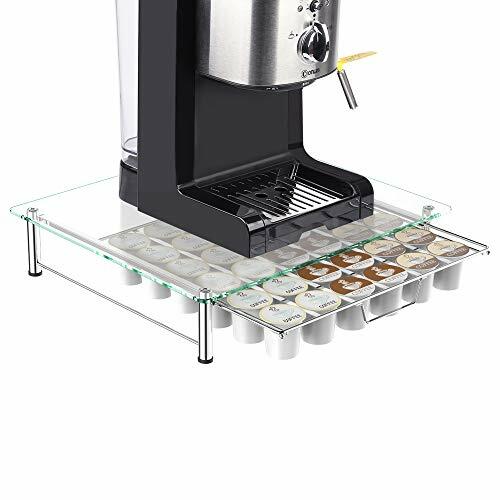 This coffee pod drawer allows one coffee machine stands on top with holding up to 40 Nespresso capsules underneath. Material: Premium Steel with coating. Dimension: 40.5 CM x 21.5 CM x 6.2 CM / 15.9 inches x 8.5 inches x 2.4 inches. Perfect for tidy up the kitchen and/or office surfaces, space saving. Exellent quality with 2-Year Wanrranty.